Rowland Siddons Smith was born on 11 November 1867 in Bareilly, Rohilkhand (now in Uttar Pradesh), India, the only son and eldest of the seven children of Rowland and Mary Smith. His father was an officer of the Bengal Staff Corps, who had served with 59th Regiment of Bengal Native Infantry in the East India Company from 1852, through the Indian mutiny and, later, during the 2nd Anglo-Afghan War. About 1873, Major Rowland Smith and his family returned moved to England—first to Yorkshire, where a daughter was born, and later to the Isle of Wight, where two more daughters were added. He returned to India just prior to the Second Anglo-Afghan War, during which he commanded 8th Regiment of Bengal Native Infantry, and after which he was invalided to England. His final daughter was born in 1881 on the Isle of Wight before the family moved to Red Hall at Bracebridge Heath near Lincoln, where Colonel Rowland Smith died suddenly on 24 July 1893. His mother subsequently settled in Caversham, Oxfordshire. 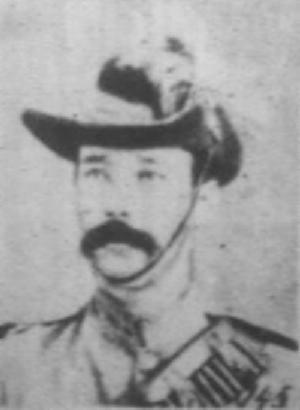 Prior to the outbreak of the Boer War, Rowland Siddons Smith was living in Australia in Mackay, Queensland. He enlisted into the Queensland Defence Force for service in the war and joined No. 3 Company, 2nd Queensland Mounted Infantry. The contingent left Brisbane on the SS Maori King on 13 January 1900 and disembarked at Cape Town on 24 February. The unit was engaged in numerous actions throughout the following year and for his service Smith was awarded the Queen’s South Africa Medal with clasps ‘DREIFONTEIN’, ‘JOHANNESBURG’, ‘DIAMOND HILL’, ‘BELFAST’, and ‘CAPE COLONY’. On 23 October 1901, Smith was commissioned into the British Army and appointed Captain in 3rd Battalion, The West Yorkshire Regiment (Prince of Wales’s Own), with which he then served on garrison duties in Malta from December 1901. In 1903 he was appointed as an Instructor of Musketry, an appointment he held until early 1905, but in December, he resigned his commission. A little over a month later, on 20 January 1906, he was appointed as translator to the British embassy at St. Petersburg, then the capital of Imperial Russia. While in post in 1912, he produced a translation of a series of short stories by the author Vsevolod Mikhailovich Garshin. Following the outbreak of war, Smith was appointed to the Special Reserve of Officers on 2 October 1914 as a Captain in 3rd (Reserve) Battalion, The West Yorkshire Regiment (Prince of Wales’s Own) but he did not take up his commission. During the course of the war he continued to serve with the embassy in Russia and for his war service as ‘Translator to His Britannic Majesty’s Embassy, Petrograd’ he was made an Officer of the Order of the British Empire on 7 January 1918. In consequence of the Russian civil war, in the first days of March 1918 Smith and the other staff from the embassy withdrew to Helsinki, and then returned to England. Four months later, on 20 September Smith left the United Kingdom onboard the SS Aquitania, beginning a journey to Vladivostok to join the staff of Sir Charles Eliot, the newly appointed ambassador to Siberia. A little over a week later he arrived in New York and travelled overland to San Francisco, where he boarded the China Mail Steamship Co. ship SS China. Rowland Smith died at sea on 22 October 1918 just before the China arrived at Honolulu; the cause was later given as nephritis complicated by bronchitis and pneumonia. In the absence of any other instructions, the British Consulate arranged for the burial of his remains in Oahu Cemetery, Honolulu on 11 November in a small funeral led by Canon Ault of St Andrew’s Cathedral and attended by the consul, Mr E. L. S. Gordon, his wife and his clerk. Captain Smith is buried alongside Engineer Sub-Lieutenant John Gemmell. The War Office was notified of his death by the Foreign Office on 30 January 1919, which caused a flurry of bureaucratic activity due to his military rank and the lack of War Office records about his service with the Colonial Office. In October 1922 his file was examined by the Imperial War Graves Commission to ascertain whether or not his was a war grave—it was determined that it was not. Smith’s sister, Elinor, served as a VAD at St. Anne’s Hall Auxiliary Red Cross Hospital, Caversham in 1915 and 1916. 1. (Back) Rowland Smith (1835-1893) married Mary Isabel Delpratt (1842-1930) at St John’s church, Calcutta on 31 December 1866: Lawrence Henry (16 December 1868-6 March 1869); Margaret Agnes (21 December 1869-5 February 1943); Fanny Cecilia (31 March 1871-17 April 1954); Ethel Mary (1873-10 March 1900); Elinor Amy (21 July 1874-15 April 1958); Mabel (1875-NK); and Eleanora (30 July 1881-NK). 2. (Back) Rowland Smith was commissioned on 26 August 1852 for service with the 59th Regiment of Bengal Native Infantry in the East India Company. Lieutenant 23 November 1856, Captain 26 August 1864, Major 26 August 1872 (Bengal Staff Corps), Lieutenant Colonel 26 August 1878, and Colonel 26 August 1882. Smith commanded the renamed 8th Regiment of Bengal Native Infantry at Rawalpindi and during the Second Anglo-Afghan War on the Hissarak Expedition from August 1879 to July 1880, after which he was invalided to England. He was present during the attack of the Mohmands on the rafts between Jalalabad and Daka. 4. (Back) London Gazette 9 November 1914. Issue 28968, p 9116. 5. (Back) London Gazette 7 January 1918. Issue 30460, page 385. 6. (Back) Recalled to duty with the diplomatic service in 198, Sir Charles Norton Edgcumbe Eliot KCMG, CB (later GCMG) had been the vice-chancellor of Hong Kong University. In an odd coincidence, following his term as ambassador to Japan (1920-1926) he remained in Japan until he fell ill with influenza in 1931—he died at sea on the journey home on 16 March 1931 and was buried at sea. 7. (Back) TNA. PRO. (1918-1919). Captain Rowland S. Smith, The Prince of Wales’s Own (West Yorkshire Regiment). WO 339/34560.